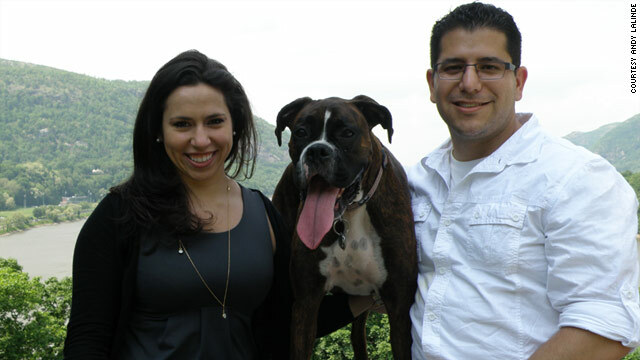 Michelle Przybyksi, 26, and Andy Lalinde, 33, pose with their dog Domino at West Point last month. The couple met through an exclusive online dating website for college students. (CNN) -- Though they had perhaps crossed paths several times on campus, it was only when Andy Lalinde was scrolling through images of cute girls online that the one with brunette hair standing in some South American country caught his eye. He opened her profile and saw her name was Michelle Przybyski. She was 26 and studying to be a nurse. Better yet, she lived only a few blocks away. With nothing to lose, Lalinde wrote a funny message proclaiming his love for nurses and hit send. One walk of four hours with Lalinde's dog, Domino, around campus and a date at the library (that didn't really involve studying) later, the two Columbia University graduate students applied for a marriage license in New York just 10 days after meeting in person. "I think when you know, you know," Michelle said. While they could have passed each other walking to class, it took Datemyschool.com -- an online dating website exclusively for college students -- to bring them together and officially exchange vows on April 29. Lara Hirner, a grad student at Columbia University's Teachers College, has gone on dates to the opera, Central Park and ice cream shops with guys she met on Date My School. "The guys place the same priority on education and the same passion for their careers as I do," Hirner said. "We're also at similar places in our lives, being students, which makes it easier to relate." Columbia University students Balazs Alexa and Jean Meyer started the dating website on campus in November. This month, the site launched at 140 more schools nationwide, giving more college students the opportunity to meet their future husbands or wives. Alexa and Meyer, both recent graduates of the Business School, came up with the idea after a girlfriend complained that there was not enough testosterone in the School of Social Work. On the flip side, men in the Business School often wished for more women study buddies. With more than 20,000 registered users, the site continues growing and has doubled its members in the past four months. Some have compared it to Facebook -- pointing out that the social network was also open to only college students when it began. "We expanded in a similar manner that they did initially, but then they opened it up for everybody in the world," he said. "We will never do that." In its first few months, Date My School was only offered to undergraduate and graduate students at 20 schools, including Columbia, New York University, Harvard University and MIT. He added that the site is successful because it's safe, and it works. "Usually, people have a date within the same day they register," Alexa said. "If you go to any other dating site, you have to have conversations with other people for weeks before you can be sure it's safe, that (the person) is not a freak." With Date My School, there's an initial trust that stems from choosing dates who share common interests and live on campus or attend a nearby school. That's the beauty of Date My School, says Julie Spira, an online dating expert and author of "The Perils of Cyber Dating." "A student at GW might want to meet someone to date at American University," she said. "Now, it's both technically and geographically possible for them to find love online." The site fills a void for college students in the online dating world. According to Spira, about 25% of match.com users are 30 years or younger, and there's no guarantee they're college grads. Date My School is the only dating site that specifies the user's alma mater. While Date My School's creators want to distance themselves from Facebook, Spira credits it for lifting the stigma surrounding online dating. Spira, who tried online dating in 1994 before match.com and eharmony.com existed, explained that people now feel comfortable talking to others and forming relationships online. "If it wasn't for Facebook's popularity ... it wouldn't have allowed online dating to really become what I feel is now social dating," she said. The Pew Internet & American Life Project surveyed the number of online daters in 2006. Results indicated that one in 10 Internet users have tried online dating sites. The number is much higher today, according to Alexa, but people still avoid online dating because they're embarrassed or believe dating sites are a waste of time. Karent Zorogastua, a second-year grad student at Columbia's School of Public Health with a hectic schedule, registered with match.com but stopped after guys she was not interested in contacted her. "There was one guy who looked like Flavor Flav, and I was like, 'Oh no, this is not working for me,' " she said. "Nothing against Flavor Flav, but he's not my type." Zorogastua said she'd be more willing to give Date My School a go, since she could narrow the search to a student also in an intense grad program who understands she doesn't have to time to commit to a serious relationship. "A lot of people knock it, they just thinks it's kind of cheesy, but you know what, it's an option," Andy Lalinde said. Before registering on Date My School, the 33-year-old wanted to be in a relationship but was just too busy to go out. "It was always just me, the dog and school," Lalinde admitted. He says he has Date My School to thank for meeting his wife and now helps his friends write profiles because his humorous tone is what attracted Michelle. Alexa and Meyer, 29-year-old best friends who have made running Date My School a full-time job, plan to continue expanding the site across the United States and eventually France, where Meyer is from. A recent $500,000 grant from investors and future business prospects are helping them turn their match-making service into a profitable venture. And with the thousands of datable women at their fingertips, you'd expect the guys to be at the movies every night. But Alexa said they have a strict policy that forbids dating anyone on their site. "Of course, girls are writing to us all the time, but we try to resist," he said.